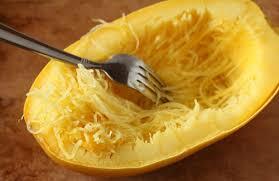 Spaghetti squash is sort of an odd vegetable, isn’t it? Oblong and kind of chunky, they don’t look like much from the outside. But, when cooked correctly, this unassuming gourd is full of vitamins and minerals, and makes an outstanding low-carb substitute for pasta in almost any dish. The Instant Pot is wonderful for cooking all kinds of squashes, because of the speed at which it cooks, and for the texture of the foods once they are done cooking. Vegetable spaghetti is no exception. And, there is a HUGE plus for cooking in the electric pressure cooker…in order to fit inside the liner of the pot, it is best to cut the squash in half on the short side, NOT cutting it lengthwise. This will result in longer strands of the “spaghetti” as the fibers of the vegetable grow around with width instead of the length. Make sure you are using a sharp knife, as even cutting the short mid-section of the squash will be hard if the knife is dull. Once you cut the squash, use a large stainless steel spoon to take out the seeds and the inner strands, and discard. Place a trivet and one cup of water at the bottom of the liner of your Instant Pot. Place both halves of the squash on the trivet – it is ok that they overlap. Lock on your lid and make sure your toggle is set to sealing. Set the manual/pressure cook time to 7 minutes. Any more than that and your squash will really be squashed – the strands will be overcooked and won’t hold their shape. When the timer goes off, you can do a quick release of the pressure. Be careful when you open the lid! Using tongs, remove the two halves of the squash onto a plate and let them cool for a few minutes before you handle them. Using a clean kitchen towel or a hot pad, cradle one half of the squash in one hand. 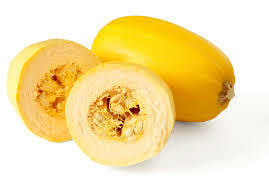 Use a fork to “comb” across the inside of the squash. The long strands of the spaghetti will fall out onto the plate, ready to be used in any recipe!